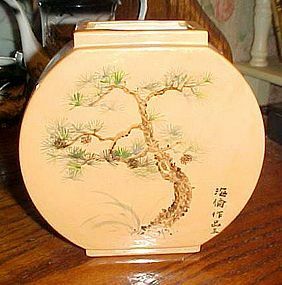 Really nicely decorated japaanese Asian vase is hand painted glazed ceramic. Disc shape and measures 6" tall and 6" wide by 2 1/8" thick. would fit nicely in a window. No makers mark but there is Japanese character lettering on the front (which I can't read). Perfect condition. Sweet vintage Heidi figurine from the 40's era. Block pottery California operated from 1940-49. She is well marked on the bottom. 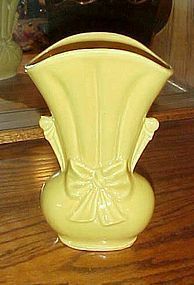 Measures 7" tall and wears a soft yellow dress with tan apron. 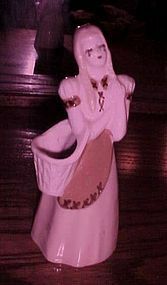 The basket she is carrying is the vase portion of the figurine. Great condition. 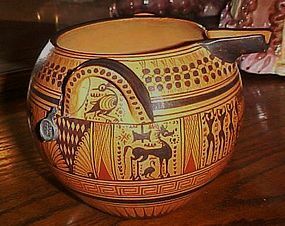 Beautiful Museum replica of an authentic Greecian vase from the 550 BC geometric period, This vase has 2 ear type handles and a spout. Measures 4 1/2" tall. Vase is in perfect condition and has the hand painted information on the bottom along with the lead tag that says hand made exact copy. This is an awesome piece and in perfect condition. 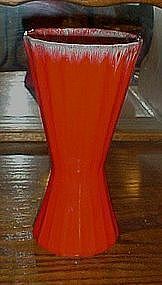 Amazing retroceramic vase is bright orange with a subtle drip edge. No makers mark but is a very nice vase that is in PERFECT condition. Measures 10" tall. I had my beautiful orange and yellow roses in this vase for a few days and they looked amazing. Nice large pink/shrimp colored round ball vase. Measures 8" tall and opening is 3". No chips, cracks or other flaws! Condition - PERFECT. Not marked,and no sticker, but this may be one of the Haeger Floral pieces. 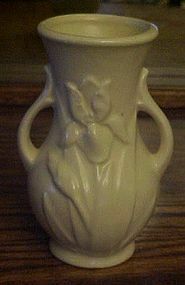 Pretty matte glazed vase with a relief iris flower on front and back side. Vase marked USA. Made by Shawnee. Perfect with no chips or cracks. Measures 5 3/8" tall. 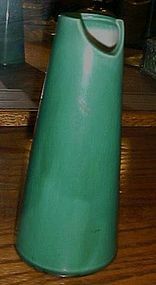 Unusual Eames era moderne style vase measures almost 7" tall and has greeen outer glaze, and white inside. Signed Edythe Lovell 1-15-58. Interesting notch at the top would make an interesting floral display. Great condition. Fleabite size glaze chip on the bottom. You have to look really hard to see it. 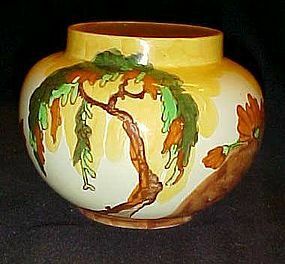 Beautiful Clarise Cliff vase in the Memory Lane pattern, of colorful trees and flowers. Art Deco shape #177, and believe this vase made between 1925-1930. Vase is 4 3/4" tall and has no chips, cracks or damages. Brown Mark on the bottom; Memory Lane Royal Staffordshire Pottery Wilkenson Ltd Burslem England. also has the number 234 L/S in relief under the glaze. Pretty glaze on this large 9 1/2" tall vase with a twist or swirl pattern. 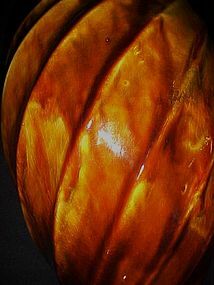 Lovely earthy colors of browns and tans with a drip glaze in spots. The glaze is so thick on the bottom it has filled in the words where it is illegible. You can make out USA. This could be McCoy, Shawnee or even Red Wing. 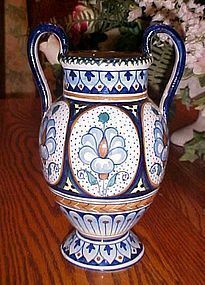 Never the less.. it is a wonderful vintage vase in a classic style. Perfect condition. Cute nursery planter is a pair of baby booties with blue bows. 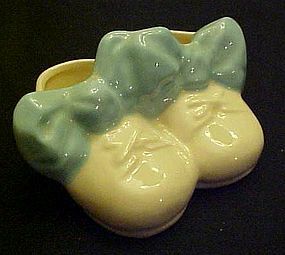 Made of glazed ceramic, and would be perfect for a baby boy's nursery.Measures 2 1/2" tall and 5" wide and 3 1/4" deep. Perfect condition with no damages. Also, a sweet addition to your shoe colletibles. 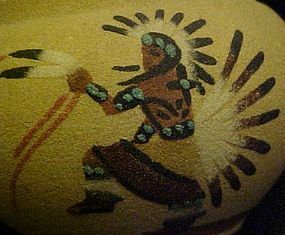 Authentic Native American squatty vase, Sand painted Indian Eagle dancer, and a mountain on the back side. Measures just under 4" tall. No chips or cracks. Hand signed JY, but not sure of who this is. Probably 1980's era. I have a matching piece listed signed by the same artist. No damages or repairs, NICE. Inside has a few scratches and scuffs. 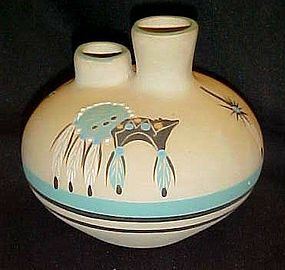 A great American Indian pottery vase, artist signed by Betty Selby, dated 1988, Number 361 on the bottom too. 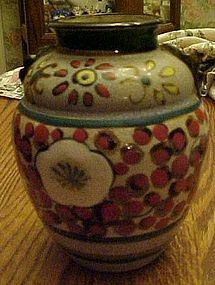 Vase has two holes and is decorated with feathers and Mandella's. Turquoise, brown and white colors. Measures 5" tall. No chips, cracks or damages. 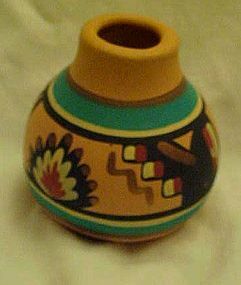 Nice miniature American Indian Navajo pottery vase measures 3" tall and is in Perfect condition. 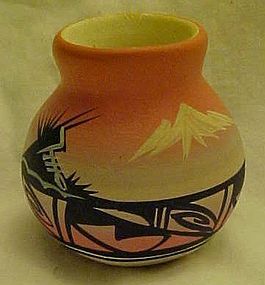 Nice miniature American Indian Navajo pottery vase measures 2 1/2" tall and is signed by the artist, R. Hathale. Perfect condition. Picture does not show but it has an Indian on the horse (End of the Trail). 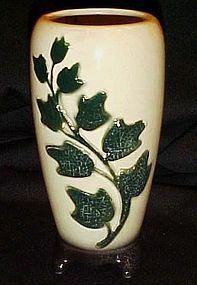 Nice 7" ivory color vase with black base and tendril of ivy up the front. Leaves have an almost cracle effect. Very nice condition with no hairlines or chips. Made by Royal Copley. A very old Chinese pottery vase. Hand painted and glazed. Measures 6 1/4" tall and has no damages. Hand painted chinese character signature on the bottom in brown brush strokes. No telling how old this is, and it's very pretty too.